I love soup. Soup is quick and easy. And one pot wonders. If you have any leftover ham from Easter dinner, this soup would be great. You can add just about anything to pot with stock and call it soup. The foundation of any soup is the stock. You can cook a soup in 30 minutes or less, but it will taste like you cooked the soup all day. Soup is versatile one pot wonders. This is affordable meal. I made this soup for less then $7.00. Cannellini beans very popular in Italy, especially in Tuscany. Cannellini are related to kidney beans, among others. Cannellini have many health benefits, low in fat, high in protein and high in fiber. Cannellini beans are very popular in many types of Italian cuisine. A staple in soups and salads. Cannellini beans makes a great addition to any pantry. I always have beans in my pantry. Low cost, long shelf life. So, give this soup a try, I think you will be happy you did. In a large pot over medium heat, cook onion and ham, stir often, until onion just tender. About 3 to 5 minutes. Add beans, bay leaf, garlic powder, thyme, salt, pepper and chicken broth. Simmer uncovered, about 20 to 25 minutes. Discard bay leaf. Serve in soup bowls and garnish with parsley. Enjoy! What a great recipe..I love it!!! 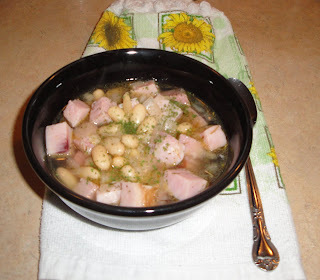 Very good way to get rid of leftover ham, I always have cannellini beans in my pantry. You've been busy over here cooking up all kinds of good stuff. I love to cook. I could be in the kitchen 24/7 and be just as happy. The kitchen is where everyone comes together, talk, laugh and make memories. I just love it. 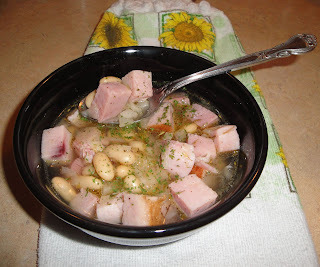 I LOVE ham and bean soup. You are so right...it's so versatile. You can go so many directions with it. This version looks great! Yum!! 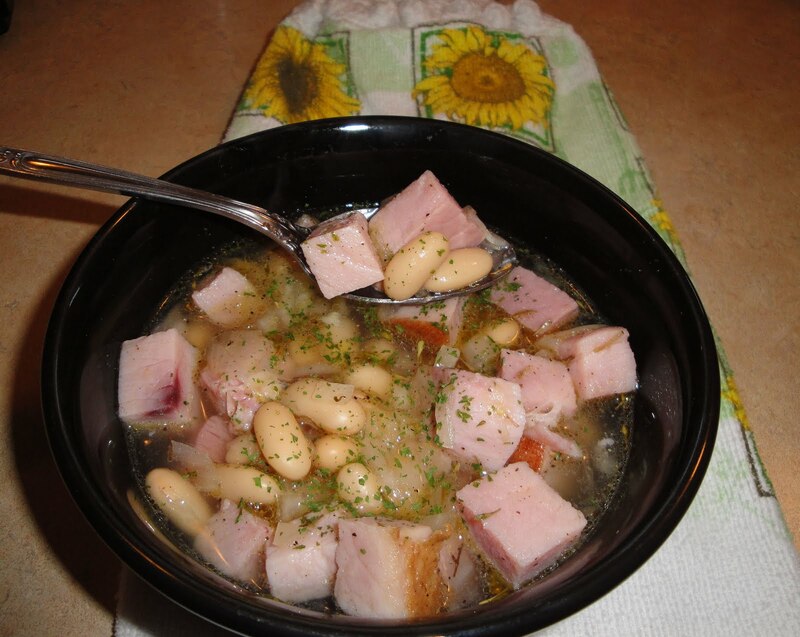 you can't really have a bean soup without ham! what a hearty soup you have prepared, just give me some crusty bread and I'll be in heaven! That soup looks so hearty and good. Happy Easter!! I've recently started using cannellini beans and LOVE them. They are so creamy. This soup sounds fantastic, with the beans and nice big chunks of ham. Perfect to use up the Easter leftovers. This sounds like the perfect recipe to use up that left-over ham from yesterday. After potato intensive side dishes, these cannellini beans will be a welcome change!